Join the members of Epoch for a fascinating discussion on topics ranging from product concept and design, transforming design ideas, and the sustainability and marketability of products. Learn more about the inspiration behind their exhibit in Somewhat Different: Contemporary Design and the Power of Convention. Epoch is a group of six young international artists and designers driven to show beauty and meaning in experimental designs. Epoch has evolved into a movement that challenges old concepts, provoking minds to think of alternative perspectives. Its members - Jinggoy Buensuceso, Martha Cech, OIivia d'Aboville, Daniel Latorre Cruz, Stanley Ruiz, and Wataru Sakuma - introduce new design concepts, hoping to reawaken the imaginative flair and creativity of Filipinos. 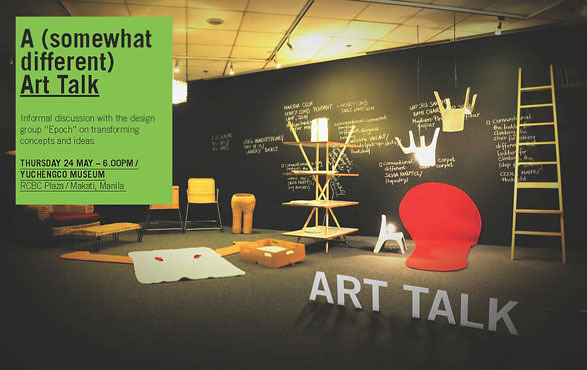 Presented by Goethe-Institut as part of the exhibit Somewhat Different: Contemporary Design and the Power of Convention, the talk will be moderated by designers Tony Gonzales and Tes Pasola. To register, contact Luisa Zaide of Goethe-Institut at program@manila.goethe.org or call (632) 817-0978.